Pat Jennings, by Jimmy Greaves! Paul Smith, the guru who has brought us all together here at Spurs Odyssey, has been rollocking me for continually having a go at those voters who managed to leave out a queue of exceptional players in the so-called �Ultimate Spurs Team� on the official club website. Always balanced and fair, Paul makes the point that I should respect the opinions of younger supporters, who were not lucky enough to see giants of the game such as Dave Mackay, Danny Blanchflower and Bobby Smith. I accept that, but I think true Tottenham fans should make efforts to explore their club history and find out more about those who laid the foundations to the club. One selection I am NOT going to accept without a good old Victor Meldrew moan is that of goalkeeper Hugo Lloris. He is a prodigious player, a true artist between the posts. 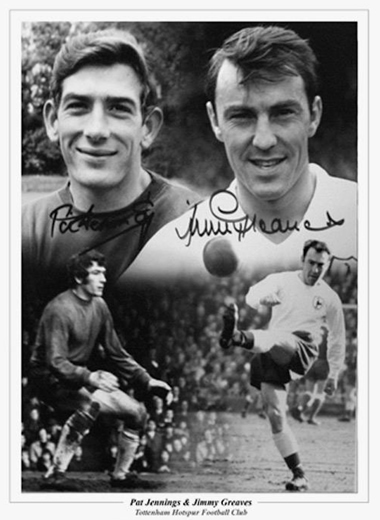 But he�s only been at the Lane for five minutes, and there is no way he should be considered Tottenham�s greatest goalie ahead of the one and only Pat Jennings. I wondered how best to paint a portrait of the Invincible Irishman for those who did not have the pleasure and privilege of seeing him play, and I have turned to the man who knew him better than most, James Peter Greaves. Before I share an interview with Jimmy, let me bring you up to date with his condition following his recent severe stroke. There was a misunderstanding when it was announced he had left hospital. He did not go home, but was transferred to another medical centre, where he is undergoing daily physiotherapy and rehabilitation treatment. Greavsie the Great faces a long recovery road, but he is tackling it with quiet determination, and his devoted wife Irene asks me to thank those thousands of supporters who have sent their best wishes. �The Man with the Bucket Hands, Pat Jennings was the best of all British goalkeepers that I played with or against. Yes, I would put him just a fingertip ahead of Gordon Banks and Peter Shilton. Yet when he first arrived at Tottenham from Watford in 1964 you would not have given tuppence for his chances of making the grade at the highest level. He came into a team that was being rebuilt after the sudden collapse of the �Super Spurs� � Danny Blanchflower forced into retirement by a knee injury, and dear John White killed by a freak flash of lightning while playing golf. Big Pat was a bag of nerves when pitched into the Spurs first team, and I used to see those shovel-like hands of his visibly shaking in the dressing room. I remember Pat telling me that he was concentrating so hard that he would suffer from headaches. Manager Bill Nicholson had to leave him out a couple of times until he conquered his nerves, and he then developed into just about the finest British goalkeeper of all time � with challenges, I have to say, from old-timers Frank Swift, Harry Hibbs and another outstanding Irish goalie, Elisha Scott. All the signs were that Pat would be an exceptional Gaelic footballer when he was at school, and he was quite casual about playing in goal in his spare time for Newry Town, while building his considerable physique by chopping down trees. Manager Bill McGarry persuaded him to come across the Irish Sea and start a Football League career with Watford, and within a year he had done enough to convince Tottenham that he was the ideal successor to �Super Spurs� goalkeeper Bill Brown. He gradually became an idol at White Hart Lane, and popular throughout the club. Modest and quite shy, he was as lovely and likeable a man as you could wish to meet, with a deep, soft-spoken voice that was rarely raised even when suggesting defensive colleagues should pull their finger out. As well as building impressive credentials at club level, he started an international career that made him a world star. I once scored a first-half hat-trick against him at Windsor Park, but I won�t mention it here. Making his debut with Pat in the same match against Wales in 1964 was a young winger called George Best. They became good pals, although leading contrasting lifestyles. Pat settled down to a long and happy marriage with Hilton Irish Showband singer Eleanor Toner, while �settled down� and �George Best� never sat comfortably in the same sentence. A little bit of trivia for you � Pat was brought up in the same Chapel Street in Newry where ten years before him Peter McParland had grown up. Peter collected an FA Cup winner�s medal with Aston Villa in 1957, and a decade later Pat got the first of his two winner�s medals in the 1967 final against Chelsea. Not a bad record for one street. Pat played more than 1,000 competitive games in all, and was voted Footballer of the Year in 1973. The highlights of that season were two penalty saves for Tottenham against Liverpool at Anfield on the morning of the Grand National � one from Tommy Smith, and then one from Kevin Keegan. All the stuff of legend. Three seasons later he was voted the PFA Player of the Year, and he is one of the few sportsmen who has been awarded both an MBE and an OBE. It all came as a surprise to Pat, whose next boast will be his first. The thing people always noticed about Pat on a first meeting was the size of his hands. I used to marvel at the way he could catch the ball one handed, a legacy of his days in Gaelic football. My abiding memory of him is of Jennings the goalscorer! Tottenham were playing Manchester United in the Charity Shield at Old Trafford in the summer of 1967. Alan Gilzean and I were upfield facing the United goal when suddenly we saw the ball going first bounce over the head of goalkeeper Alex Stepney and into the net. The only time I ever saw this affable gentle giant lose his temper was against Don Revie�s Leeds Kickers at Elland Road in 1968. Mick Jones came roaring in like a mad bull and caught him with an unnecessary flying boot in the thigh. The suddenly enraged Jennings took careful aim and kicked Jones up the arse. What should have been a free-kick for Spurs became a penalty for Leeds, which Allan Clarke converted for the only goal of a bad-tempered match. Our skipper Dave Mackay, I recall, was so incensed that he grabbed the ball and kicked it with all his might out of the ground. I thought the Tottenham directors were bonkers to allow Pat to move to deadly rivals and neighbours Arsenal in August 1977, when he was 32. It was like Paul McCartney going from The Beatles to the Stones. Spurs obviously thought he had little left to give, and they had Barry Daines as a replacement. I also know that Pat was cheesed-off with the Spurs board at the time because they would not give him a loan to help him buy the house of his dreams. They just had no idea how to repay him for his great service to the club. Pat answered Tottenham�s lack of faith in him by playing on for another eight years at Arsenal, and he became as big a hero at Highbury as he had been at White Hart Lane. He played a major part in getting the Gunners to three successive FA Cup finals, emerging as a winner in the middle one, 1979. �I know a lot of Tottenham supporters were upset with me going to Arsenal,� Pat said. �But it suited my domestic life, because there was no need for the big upheaval of having to move to a new area. I was just happy to still be playing at the top level and I gave Arsenal the same one hundred per cent commitment I had always given to Spurs. Of course, the fact that my old Northern Ireland captain Terry Neill was in charge at Highbury helped make it a smooth transition. Pat semi-retired in 1986 to concentrate on golf, which he loved, but he kept his eye in by returning to Tottenham in a coaching capacity while retaining his player registration. At the back of his mind was playing his last game in the 1986 World Cup finals, and he tuned up by going in goal for the reserves. Next week: MY Ultimate Spurs team! Who played 221 League games for Tottenham, won 52 international caps and wore the No 1 shirt in the 1982 World Cup finals, plus with which club did he start his managerial career? The answer was dear old Ossie Ardiles, who followed Les Allen, Dave Mackay and Glenn Hoddle as an ex-Spurs man taking charge at Swindon Town. The No 1 shirt? The Argentinians numbered their players alphabetically, if that makes any sense! Ossie wore No 2 when playing a key role in Argentina�s 1978 World Cup triumph, shortly before arriving at Tottenham with Ricky Villa in an extraordinary double deal. First name drawn from the correct answers is John Dodd, from Okehampton in glorious Devon. I will email a screen version of one of my Tottenham-themed books to John, who has been following the fortunes of Spurs for the little matter of 55 years. His two Spurs-daft sons once had two budgies named Garth and Lacey! Who was Tottenham�s first �1m-plus signing and with which club did he start his League career? Please don�t forget you can purchase any of my books from me at www.normangillerbooks.com, including No 99 that I have written in tribute to Muhammad Ali for whom I worked as a publicist on his European fights. All profits from my Tottenham-themed books go to the Tottenham Tribute Trust to help any of our old heroes who have hit difficult times.